The fortunes of 3000 Morena activists, previously elected in 300 district assemblies, was determined yesterday in a lottery. In this way the party led by Andrés Manuel López Obrador selected two thirds of its multi-member congressional district candidates. Afterwards the Morena national council appointed outsiders – academics, human rights defenders, writers and rural leaders, among others – to fill the remaining candidacies. “We successfully incorporated sortition into the process of selection of candidates. It is unprecedented, never seen in the history of our country,” said López Obrador about the lottery method. The salient feature of modern democracy is that those who wield legislative and administrative power are chosen by popular vote in open competition between candidates. In practice the candidates generally present themselves as representatives of a party with a distinct ideological emphasis. Some voters who share a particular ideological position will normally support the same party, though they may disagree on many matters of policy. Others, less ideologically committed, are “swinging voters”, taking a more pragmatic view of which party to support. In either case, voters are constrained to chose between packages of personalities, policies and promises. The processes by which the parties arrive at these packages are not very transparent and are widely distrusted. For good reason, as I shall attempt to explain. The alternative I propose is that the policies we adopt in any specific sphere of public decision-making should be determined by bodies that are statistically representative of those most directly affected by what happens in that sphere. These bodies would have no formal constitutional status. They would depend for their authority on community recognition. We would constrain our elected representatives to activate those decisions in legislation and administration on penalty of not being elected or re-elected. Instead of being consumers faced with a choice between packages over whose contents we have little influence, we forfeit any attempt to impose an ideological flavour on the whole range of public decisions and concentrate on getting sound decisions in those matters that affect us most. The focus of these bodies would be on specific problem areas. There would be no attempt to prescribe for every possible eventuality. The whole would be treated as an ecosystem that mostly looks after itself, as various interactions adapt to eacn other. It is far too complex and unpredictable to be planned, but its stability and development are constantly being threatened by various human activities that may need to be regulated or eliminated. Here’s a nice piece in today’s Irish Times, showing clearly the need for lottery selection in jobs. It asks the question: Why women (despite being over 50% of the faculty staff) fail to take an equal share of top posts in academia? To which a wise commentator replies: “You think merit has much to do with academic appointments? There’s usually an assessor’s box called suitability which you can fill with subliminal prejudices: plays golf, politics, sounds like me etc”. While waiting for grand schemes of sortitionist democracy to be implemented, wouldn’t it be nice to have a bit of genuine equality based on lottery selection over the qualified candidates? Docksey: Has Democracy Gone Missing? Or was it ever here? With a general election looming in the United Kingdom and Spain possibly following Greece’s revolt against austerity later this year, we need to think, not just who or what we are voting for, but why we should vote at all. We live in a democracy. Now exercise your democratic right and vote for us. But what is the point of voting if, no matter who you vote for, what you get is the same old, same old? 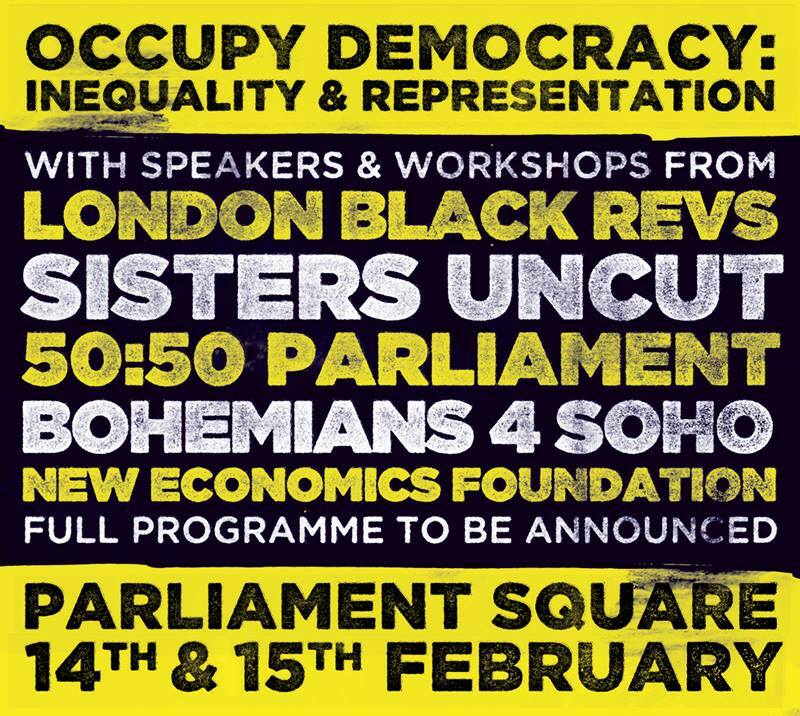 The Sortition Foundation will be holding a discussion on sortition at Occupy Democracy : Inequality and Representation this weekend. Come along, invite your friends!